So cool. We’d like to cover this for Mashable. How much does each card cost to make, and how many did you create? Good luck with your interview — let us know how that went! I would be glad to have this covered on Mashable! 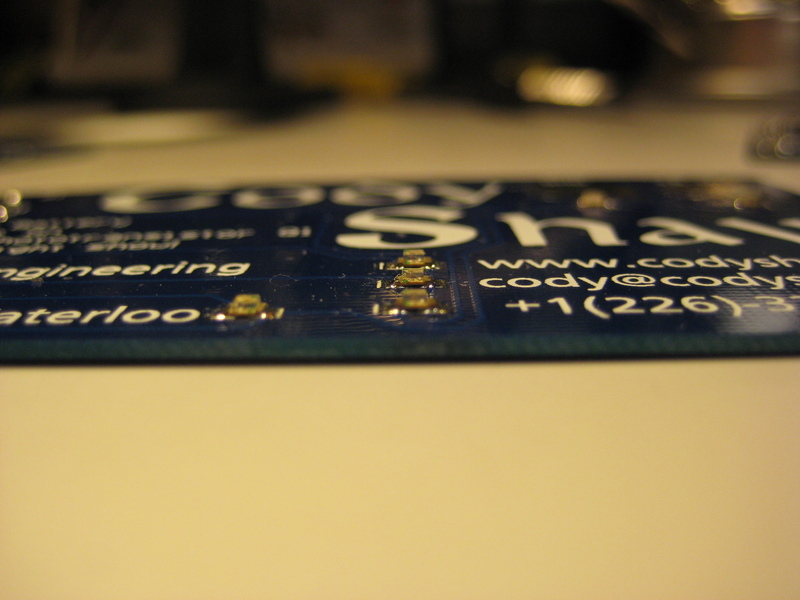 They are around 3$ each (after prototyping), and I ordered 50 PCB’s. My interview went great! Thank you for inquiring! Great idea Cody! Did u have the PBC’s pre-printed with your contact info? That is a great idea and a great job. I really like it. Thanks! I loved doing the project, I’m glad you enjoyed it! 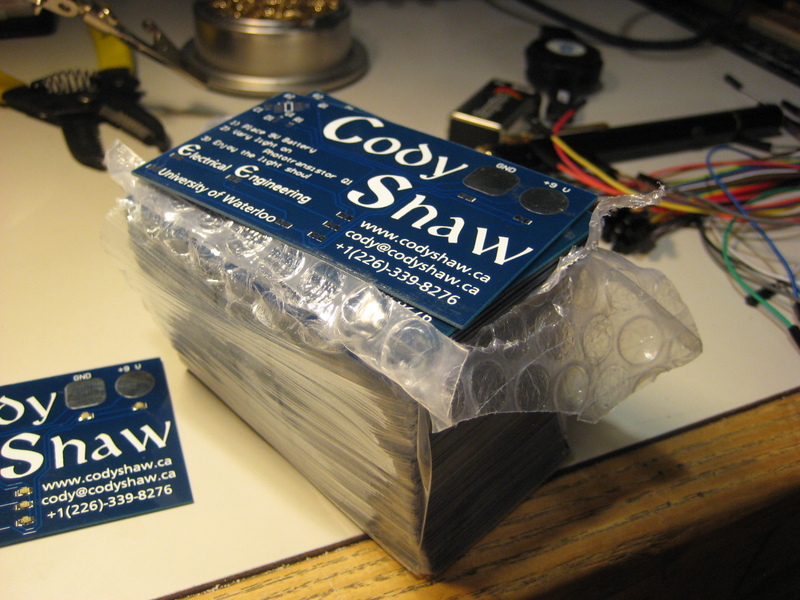 Pingback: Engineer Creates Coolest Business Card Ever [VIDEO] Down With A.P.P. Greetings from your neighbour in Toronto! That is really neat! As a fan of Arduino and waiting for my Raspberry Pi in the mail, and having developed a few apps for the Blackberry Playbook… This kind of stuff really gets me excited! 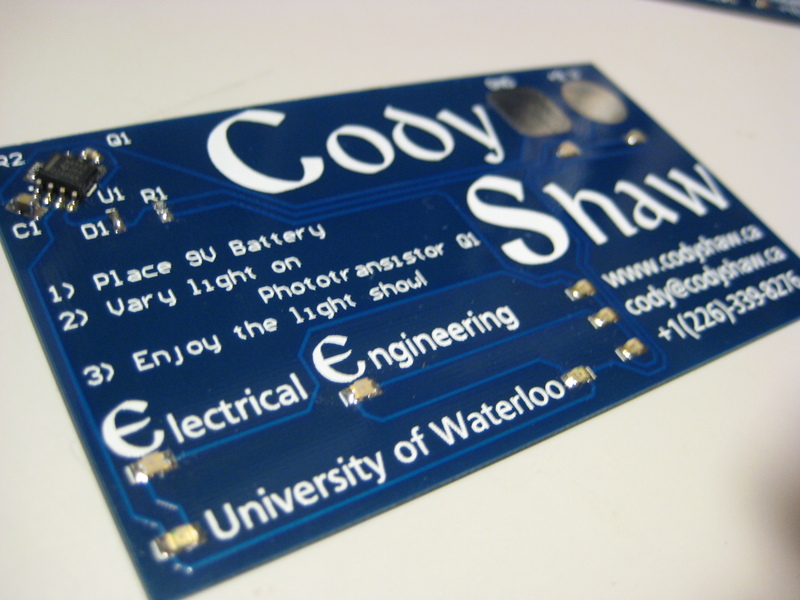 I would be so happy if I got a printed PCB business card from someone, so I am sure the people you give it to will keep it and remember you! Great way to differentiate yourself! Awesome job! 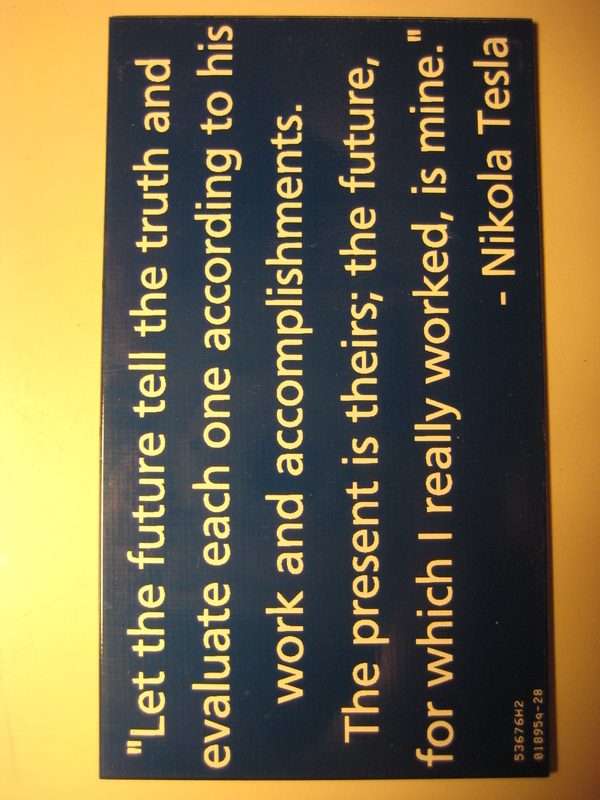 I really like the quote from Tesla on the reverse, I’m guessing this is a response to Marconis’ nobel prize? Please let me know when it’s available in Perth Australia. I don’t plan on making enough of these to send out randomly, they are meant for employer interviews at places where I would really like to work. Sorry! As an experienced electrical engineer, I’d suggest you do not run the three strings of LEDs in parallel, but rather have each set of three LEDs have their own 150 ohm series resistor to Vcc. 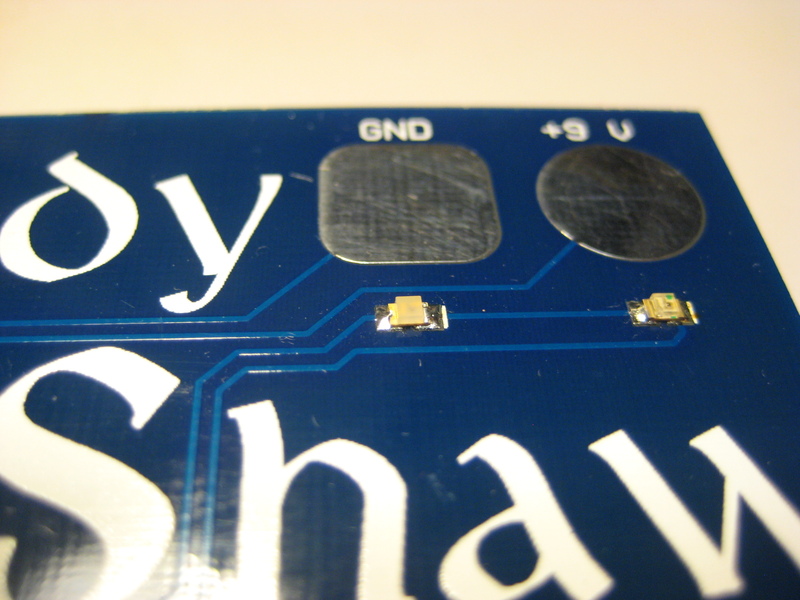 Otherwise variations in the LED forward voltage will cause uneven or excessive currents (or no current) to flow through each string. You may not be familiar with circuit simulation tools (PSpice or NL5) and worst case analysis (or extreme value analysis) where variations of real world parts are used to check circuit performance versus assuming all parts have the same nominal data sheet value. Thanks, and good luck. Noted, thank’s for the feedback! Hi, loved it! After you’ve designed it , where did you go and order them? I ordered them from SEEED Studio. Hey Cody. I just got started in electrical eng. Love this idea. 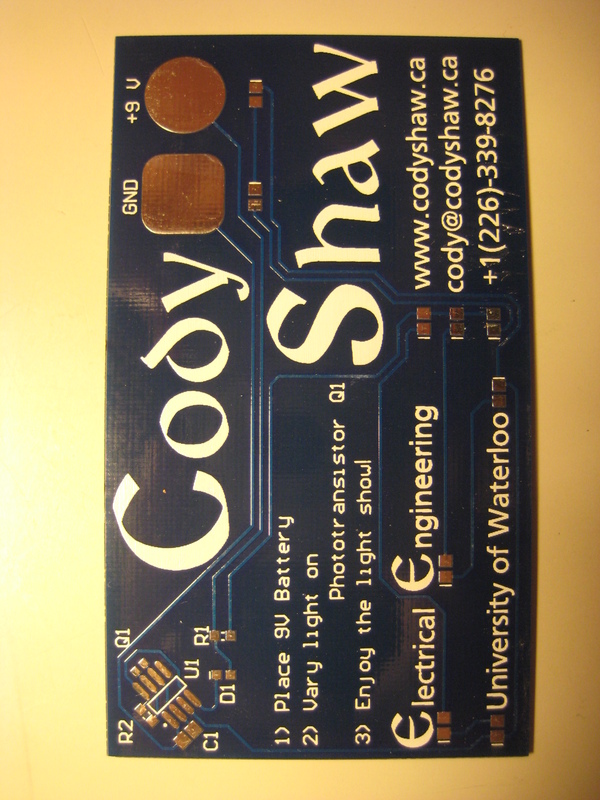 Not mean to copy you but without knowing pcbs how can i replicate this? And even how to incorporate david’s suggestions ? Good to hear there are people interested in this type of thing! 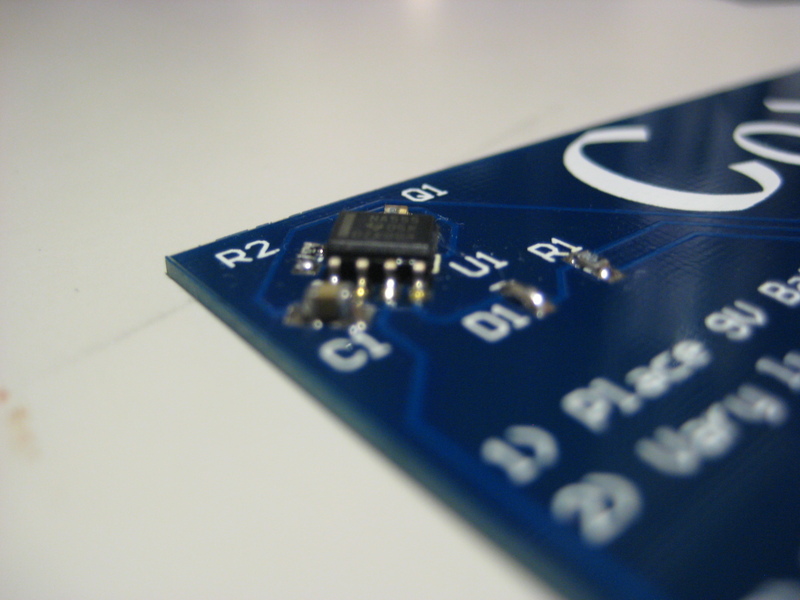 I got started by simply playing around with free circuit design programs (See http://en.wikipedia.org/wiki/Comparison_of_EDA_software, KiCad is quite popular). You can easily branch out from there. Adding David’s suggestions would be quite easy, though I don’t agree with them for this application. I love it! So creative. 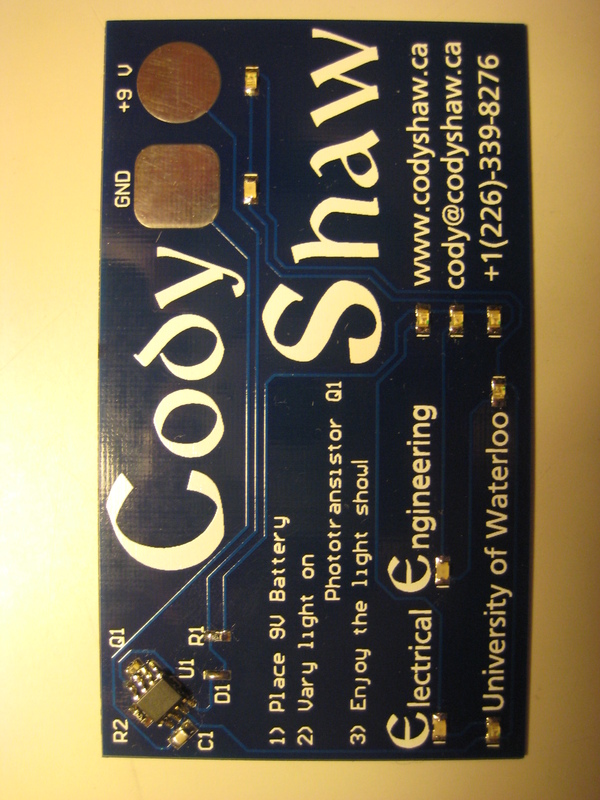 I am an electrical engineer, as well!